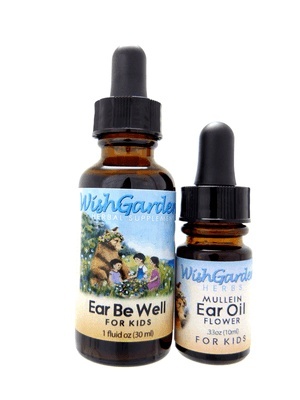 This combo pack includes Ear Be Well and Mullein Flower Ear Oil. 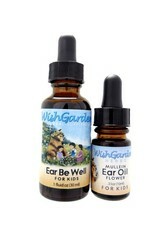 WishGarden Herbs' Ear Be Well uses lymphatic and immune herbs to reach into the inner ear. Mullein Flower Ear Oil, applied topically, soothes sore ear canals. Mullein Ear Oil (Witch Hazel bark, Garlic bulb, Calendula flower, St John's Wort aerials, Mullein flower, Organic Gluten-free Alcohol, Vitamin E Oil, Olive Oil), Ear Be Well (Calendula flower, Echinacea Purpurea root, Baptisia root, Garlic bulb, Bee Propolis, Red Root, Scullcap aerials & St John's Wort aerials).